1. To access the VPN service, log in to CIT Staff Gateway (http://gateway.cit.ie) and click the Web VPN button in the Staff Services column. Alternatively, you can type webvpn.cit.ie directly into your browser bar. 2. Select your group from the drop-down menu (e.g. CIT-Staff), then log in using your staff username (in the format firstname.surname) and password, as you would to log in to your staff email or to the computers on campus. 3. 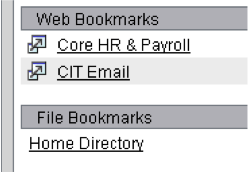 Once you have logged in, you will see the home screen (below), with links to Core HR & Payroll, CIT Email, and Home Directory. 4. 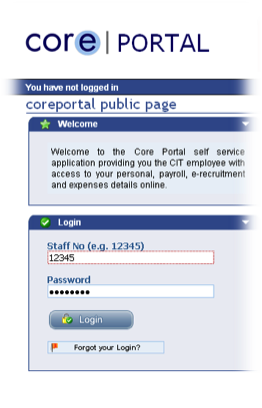 Click on the Core HR & Payroll link to be taken to the Core Portal login screen (below). Log in as usual, using your staff number and your Core Portal password. If you are having difficulties logging in, click Forgot your Login?, which will send an automated email to your account with further instructions. Please note that it can take up to 10 minutes to receive this email. N.B. : Please ensure that you are using either Internet Explorer or Mozilla Firefox to access Core Portal. Other browsers, such as Google Chrome or Safari, will cause the application to hang. 5. Once you have successfully logged in, you will be able to access your Core Portal account. This means you can now view your payslips and access other Core Portal facilities remotely. 6. When you have finished, click Logout to end your session of Core Portal only. You will still be logged in to the VPN service. 8. Click the arrow button to move the toolbar to either the left of right of the screen. 9. Click the Home button to be returned to the VPN service homepage at any time. 10. Click the Logout button to log out of the VPN service. 11. From the VPN home screen, click CIT Email to be taken directly to your CIT mailbox. You will be automatically logged in. 12. From the VPN home screen, click Home Directory to gain access to the contents of your H-Drive remotely. 13. From here, you can not only access and edit files stored locally on your PC, but also Upload files remotely and create a New Folder, which will then be stored on your H-Drive. 14. When you have finished, click the Logout button on the top right of the screen (if on the VPN service homepage) or the logout button in the toolbar (as seen in Step 9) to log out from the service.